We always talk about Peacock …the male being one of the most beautiful and largest flying birds of the avian world ,who can not choose her partner for courtship or having the next generation to follow him . The Power to choose a male with whom the peahen would mate and would have the off springs has been given to the Peahen( on October 2016female ) about whom we rarely talk about. The peahens are mostly brown with a white belly and green neck, head and the crest. The coloration of the peahen is such that it can gel with the ground and the vegetation present during the breeding period and she can protect her eggs as well the off springs from the predators.The peahen after checking the male with whom she would like to mate offers by sitting on the ground and after the courtship is over she goes off to lay eggs and raises the off springs herself. 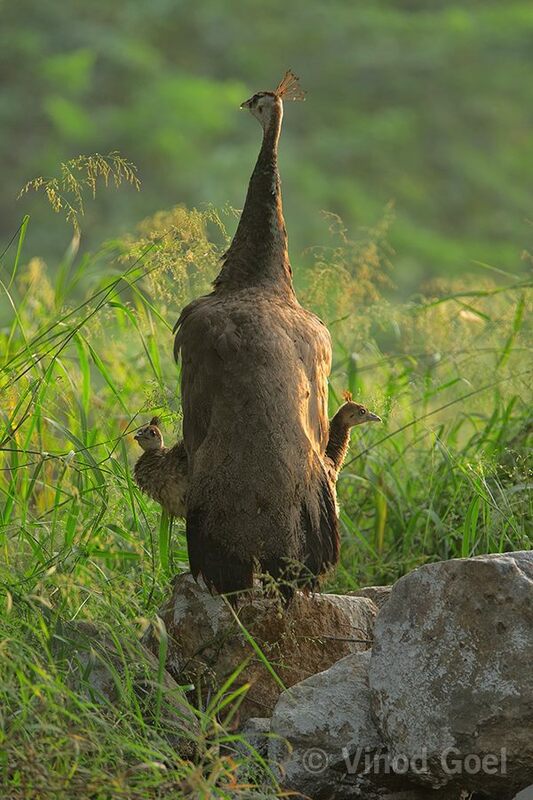 The peahen also displays her plumage to ward off female competition and signal danger to her young ones. 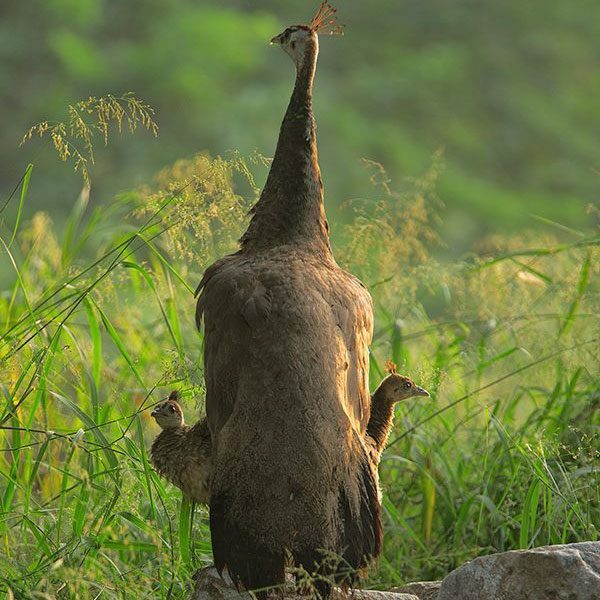 The peahen takes care of all the requirements of the chicks and protects from the predators. She also covers them under her wings. Usually the chicks remain for a year with the mother. Last year on 15th October 2016 I shot a pair of chicks with the peahen basking in the morning . The position of the chicks, one on the left and the other on the right of the peahen attracted my attention and I could not stop myself from clicking. I am sure you would enjoy the click.